Put the CBD oil down. What if houseplants did more than just purify the air in your home and look great doing it? Long gone are the days of swinging by the nearest hardware store and picking up any odd plant that looks good. Today’s online plant shopping comes with in-depth health benefits, plant-maintenance guides, and even history lessons—all geared at helping you pick the perfect green companion. On Bloomscape, each plant is graded on a scale of difficulty of maintenance, natural light levels, pet friendliness, and air-purifying properties. On The Sill, care guides recommend the right brightness, sun exposure, water intake, and humidity levels recommended for each plant and even gives a short history and bio lesson of where each came from and how they thrive in their natural habitat. No matter whether you’re a seasoned horticulturist, a self-described “plant mom,” or a notorious black thumb, you’ll find value in choosing your plants based on not just their looks, but also their ideal environment and their wellness properties. English Ivy, for instance, is known to purify over 90% of airborne mold particles that can trigger allergies. “It is a perfect plant to keep in your bedroom since it can help you breathe easier and get a restful night’s sleep,” explains Joyce Mast, seasoned horticulturist and Bloomscape’s “Plant Mom” (she’s the founder’s mother). Ahead, we asked three plant experts to share the best plants for wellness and air purification and we even pulled together an easy-care list especially for beginners. “All plants have beneficial wellness properties in some form or another,” says Erin Marino, director of brand marketing at The Sill. 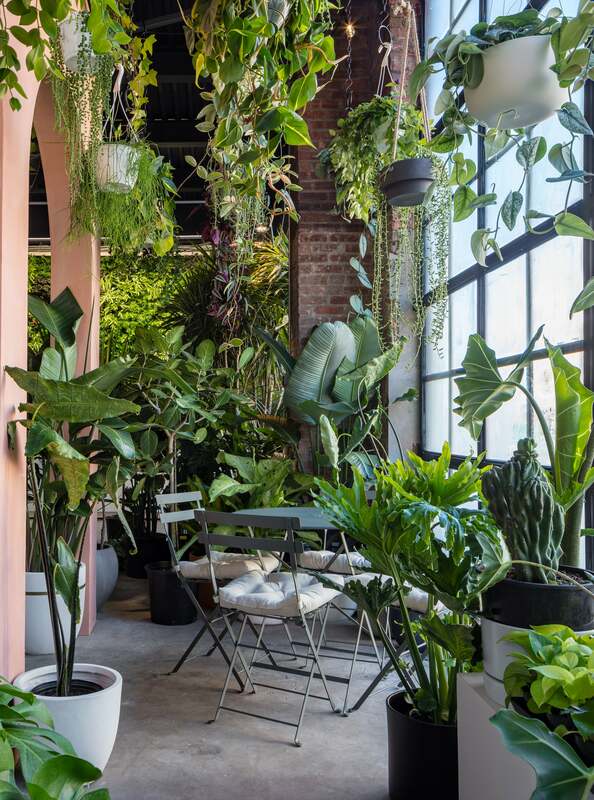 “Plants can not only enhance the overall appearance of a space, but studies have shown indoor plants can also boost moods, enhance creativity, increase productivity, reduce stress levels, bring tranquility, maintain indoor humidity levels, produce oxygen, and naturally filter air pollutants. They’re pretty insane multitaskers.” While plants, in general, can be beneficial to your well-being, some have particular attributes that make them great additions to your space. Aloe Vera is purifying in that it removes benzene and formaldehyde from the air. But its properties go far beyond producing clear indoor air: “The ‘gel’ inside the [aloe vera] leaves can soothe and heal minor skin irritations such as burns and cuts,” explains Mast. “The clear liquid is also said to have antibacterial and anti-inflammatory properties.” To use aloe vera to its full potential, Marino recommends cutting off a mature bottom leaf, splitting it open, and squeezing out the gel. “I like to use the gel for skin burns during the summer and dry irritation during the winter,” she says. For heightened productivity, the ponytail palm is a fantastic addition to your home. “Ponytail palms absorb carbon dioxide, which can contribute to drowsiness and headaches, and they release oxygen,” explains Mast. “Ponytail palms are interesting-looking plants that make a bold statement with very low water needs.” The expert recommends plenty of natural sunshine while pointing out that they can also fare well with a bit less light. Add this one to your desk at home or at work. “One of my favorite plants happens to be on the [University of Reading] list—the rubber plant or Ficus elastica,” says Bullene. “This beauty can tolerate medium light and is fairly easy to care for. It has a high transpiration rate, meaning it releases more water into the air than some other plants, helping to make spaces feel more humid and comfortable.” Mast adds that this plant is very tolerant of neglect and can be grown with very little experience. Beyond its beautiful burgundy leaves, there is one more reason to bring this powerhouse in your space: “Rubber plants are known to reduce mold and bacteria in any room by as much as 50 percent,” adds the expert. Native to southern Africa, spider plants are also known for their tremendous air purifying properties. They’re also fast-growing and nearly impossible to kill, making them healthy additions to any area of the home, from the tabletop to the mantel. “It’s a no-fuss whimsical plant with lovely arching striped leaves,” explains Mast. “It’s easy to care for, making it a great choice for beginners.” She also notes that the plant removes formaldehyde, toluene, and xylene from the air and is pet-friendly. The Pothos is another popular alternative for self-described black thumbs. “If you have much lower light, try an equally hardy but less drought-tolerant Pothos plant,” says Marino. “Affectionately nicknamed the ‘cubicle plant’ because it can tolerate less-than-ideal conditions, it’s a fast-growing, trailing tropical plant.” She recommends moderate, indirect light and watering it once every 12 days. Mast also loves the plant, which removes benzene, formaldehyde, toluene, and xylene from the air. “The Golden Pothos is an attractive, cascading, easy houseplant that looks stunning on shelves, dressers, and side tables where it can show off its beautiful bright green-and-yellow foliage,” she notes. If you have bright, direct light, succulents are low-maintenance and easy to grow, and Marino is a fan. “My favorite hardy succulent varieties are Haworthia, aloe, and Echeveria. I think they get a bad rap because people either don’t have enough light for them or overwater them,” she explains. “But if you put them in bright, direct light and water about once a month, they’ll do just fine.” She adds that if they begin to wrinkle, it means that they’re thirsty.